Shir Gold is a thief and darn good at it. 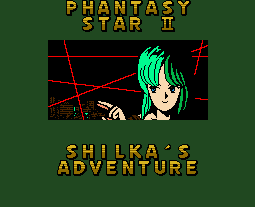 In her Text Adventure, "Shilka" is out to steal the famous painting Opa-Opa. The name is a reference to another Sega game, though I can never remember which one. Anyway, it looks like Shir will be squeezing past a laser security system, just like in the movies.